President Ana Mari Cauce awarded three outstanding undergraduate students with the President’s Medalist award. Selected for their academic performance as well as their co- and extra-curricular involvement, their high grades and well-rounded extra-curriculars, this year’s recipients are: Hannah Werbel, a computer science major; Siena Traverso, an early childhood and family studies major; and Evan Wang, an electrical engineering major. 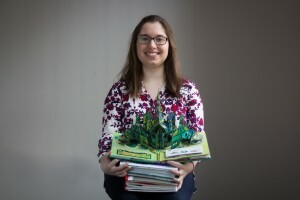 Hannah Werbel’s desire to use her creative and analytical skills to make a positive impact on the world led her to study computer science. Werbel’s introduction to research came as junior in high school, when she worked in an UW electrical engineering lab writing scripts to analyze data from brain computer interface experiments. 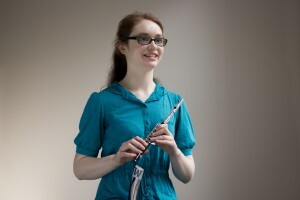 Now at UW, she has continued with research and enjoys finding practical applications to what she’s studying in class. Werbel also loves teaching, and is currently a TA for an introductory computer programming class. Outside of academics, Werbel plays piccolo in the marching band and basketball pep bands. Being legally blind, she is dedicated to increasing accessibly for other blind students. She is president of the Washington Association of Blind Students and works for DO-IT (disabilities, opportunities, internetworking and technology), where she frequently attends panels about disability in the technological fields. Siena Traverso is passionate about teaching and mentoring others. Recognizing this interest while in elementary school, Siena started tutoring in 5th grade, and hasn’t stopped since. Today, she is a peer educator with the Honors Program, where she teaches a weekly class to incoming honors students. She also volunteers her time as a peer mentor, where she fields questions from prospective honors students. Beyond her involvement in honors, Siena also works as a peer adviser for undergraduate academic advising and a tutor-mentor with academic support programs. Evan Wang’s drive to better understand the natural world led to a fascination with learning how things work at the atomic level. Over time, this led to learning the math and physics involved in reactions, and ultimately to his choice to study electrical engineering. 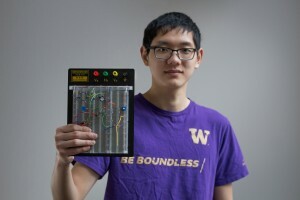 Evan has been researching with Professor Anantram to model properties of devices that may one day be able to serve as a faster, smaller and cheaper memory source in computers. Because it’s too expensive to run experiments on today’s devices, Wang is working on computer simulations to study this technology en masse. Outside of the lab, he enjoys playing French horn. Last year, he went on a tour to China with the wind ensemble.